Call for Guest Posts: How Do You Use Your Planner? Would you like to be featured on Plannerisms? Please show us how you use your planner! There have been several excellent guest posts on Plannerisms recently. Paulien's review of the Space 24, Mstraat's Taskmaster and how she uses it for work, and Helen's creative use of her Moleskine weekly as her blog planner are all examples of excellent guest posts showing how each person uses her planner. I'd love to feature how you use your planner! Especially if you use your planner in an unconventional and/ or interesting way, or if you use a planner I've never reviewed on Plannerisms before. I know everyone will be very interested to see how you use your planner! Don't we all love to see how people use their planners? 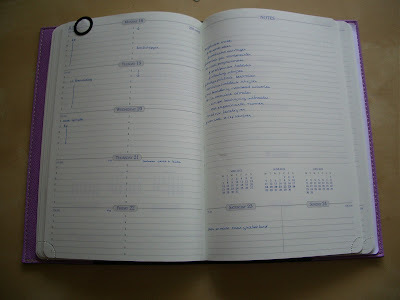 Voyeurism aside, it gives us ideas on how to use our own planner in a new way. If you'd like to submit a guest post, please email me at: laurie at plannerisms dot com. I hope to see how YOU use your planner soon! In my first two posts in this series I gave you advice on how to cope emotionally with moving overseas, and things to consider when researching your post. In this post I'll give you some packing tips. These aren't your typical moving tips on how to properly pack your belongings. Normally when you move overseas, a moving company will come in and pack your things, and they want to do the actual packing so they aren't liable for something breaking that you packed incorrectly. What I'm going to tell you about packing for an international move is more a matter of prioritizing each and every thing you own, and how long you can live without it before it arrives at your destination. Transporting your household effects can take 3 to 4 months. They have to go overland or by sea (or both), and must clear customs. So when packing, you have to be realistic about how long you can be without most of your belongings. The good news is you often get an air shipment of a few hundred pounds that will arrive in about a month. Don't listen to them when they promise it will be there in a week. Plan for 4 weeks and then be pleasantly surprised when it arrives in 3. But don't be too aggravated if it takes 6 or even 8, because that happens too. Carry on bags: Check your airline and see what your limit is. Some airlines allow a rolling carry on and a second smaller item like a laptop case or a lady's handbag. Some allow only one small bag. Make sure you know the limit for each airline for your entire journey, so you don't risk having your larger carry on bag taken away from you and checked as luggage. Important documents such as birth certificates, marriage certificates, vaccine records, medical records (or at least medical summaries), school records, etc. Scan these documents before you leave and email them to yourself in case they get lost. Any important files or papers like insurance policies etc. Important jewelery and other valuables. Your laptop, camera, phone and other devices, with chargers and adapters. Your passports and ticket information. Make sure the packers don't box this up! I like to put my carry on bags in the car the night before the movers arrive. Medicines and prescriptions, glasses/ contacts. Your planner, of course! And your address book too. Wallet and anything else you need to keep with you during your journey. Luggage: This is stuff you'll need right away, but can live without if your luggage gets lost. Keep in mind that although most airlines are very reliable these days, sometimes luggage is lost forever. So don't put anything precious in your luggage. Check your weight limit with your airline. Most airlines allow only one checked bag, so make sure you are within your limits or be prepared to pay overage. If you are moving to a place that's having different weather from your departure location, you'll need to think about different clothes, shoes and gear than you're currently using. When I lived in Moscow I sponsored a family who was moving there from a warm climate. They were due to arrive in September, and in an email before they arrived I reminded them to put their winter coats and clothes in their luggage because they would need them right away. They arrived in sandals and short sleeves and had shipped all their winter gear in their sea shipment, which wouldn't arrive for 3 months yet. It snowed a week later. Think ahead. Clothes and shoes appropriate for the weather when you arrive, especially if you are moving to a different climate from where you're currently living. Toys and books for the kids, because they will be missing their stuff. Kids' school items like backpacks, lunch boxes, musical instruments etc. Scissors. You can't put this in your carry on bag, obviously, but you'll need scissors for opening all your boxes when they arrive. Anything else you'll need immediately. Air shipment: These are things you'll need in the first month in your new place. Think of what the season will be, and what your new home will be supplied with or not. If your new place will not be supplied with kitchen items like pots and dishes you'll want to pack these in your air freight. Non-breakable items only though, because air shipment boxes tend to get thrown around. Check with your shipper if you are allowed to ship your scanner/ printer, because that is a handy thing to have right away. I like to put a few rugs into the air shipment because they aren't breakable and they make a new place seem more like home right away. Kids' bikes, toys and sports equipment because they will want their stuff. Laundry baskets are very handy to have. More clothes and shoes, especially if the season will be changing. Anything else you'll need soon. The rest of your stuff will go in your household effects shipment. Before the packers arrive I recommend separating out framed photos and wall hangings so they can be packed separately from other things. Also, remove everything from your bookshelves that's not a book. You don't want your knicknacks boxed with your books. And, return items to the rooms they should be in. Make sure all the kitchen items are in the kitchen, office items in the office, etc. Boxes will be labeled with the room they are from so it will be easier to sort items that way. Pack your carry on bags and luggage before the packers arrive, to make sure everything fits in the luggage. When we moved from Moscow, there were things around the house that I thought would fit into the luggage. We so overestimated our luggage capacity, we had to ship 6 boxes to ourselves! We don't make that mistake any more. Packers can't read your mind, so if you don't want something packed make sure to mark it very clearly! If in doubt, they'll pack it up. I've heard of crazy things being packed like the garbage in the garbage can and the roast out of the oven. Usually they have more common sense, but they don't want to be held liable for anything left behind. I recommend putting your luggage in the car or in a very clearly marked No Pack area. Also, make sure to separate out and clearly mark the items that should go in your air shipment so they don't get packed with your sea shipment. Make sure to pull out hidden items so they don't get left behind. One time the packers didn't realize there was a drawer under the oven so the cookie trays and muffin tins didn't get packed. In my first post in this series, I gave you some advice on how to cope emotionally with moving and living overseas. In this post, I'll give you some tips on researching your destination. The first thing you will want to do is to research the country you'll be moving to, or research several countries to decide which one to choose. An excellent resource for this is Real Post Reports from Tales from a Small Planet (http://www.talesmag.com, it's worth registering for). You can look up each city and read what expats who have lived there thought about it. I'm sure there are loads of other expat resources, websites and blogs. But take each report with a huge grain of salt, because each person's experience depends on their perspective. For example, a single man will have a much different experience in Moscow than a married mom of young children. Additionally, whether a person likes the post or not depends on what they like in general. If someone enjoys the countryside and fresh air, their review of a large urban post is likely to be at least somewhat negative. Keep in mind what you enjoy when considering a post. And, it's all relative. If someone just moved to a less-developed post after a relatively luxurious one, they are less likely to enjoy it than someone else who considers it a step up from where they were before. Things to seriously consider: personal safety and crime, health issues and medical care available, cost of living, availability of good schools (if you have school-age children) and availability of good food and products. Everyone has their own comfort level and threshold of tolerance. Talk honestly with your partner about what is acceptable and what absolutely is not. Do you mind taking malaria prevention medicine for two or more years? What about making your kids take it? Are you willing to homeschool if the school is inadequate? Do you feel comfortable with substandard medical care in-country? When I lived in a country with a severe lack of decent medical care, the constant worry among all the parents was that our children would become ill or injured. One woman summed it up well when she said, "I've chosen this lifestyle, but my children haven't." We were all very aware of subjecting our children to potentially less-than-safe conditions in a situation they did not choose. There were things we enjoyed about living there, but we were grateful to leave safe and healthy. Also make sure to find things you might enjoy in the country. If you love skiing, the beach, forests or city life, look for places where you can enjoy your hobbies. But don't overlook the chance to try something new. This is your opportunity to try things you've never done, see things you've never seen and go places you've never been. Also consider nearby travel opportunities. Proximity to a region you'd love to explore is a big plus. So when you are researching posts, keep all this in mind. Are you surprised I haven't discussed packing and other logistics yet? Honestly they are far less important that what I've covered in these first two posts. But, I will cover that in my next post. Is there any other aspect of moving internationally that I haven't covered that you would like to know? Just leave a comment and I'd be happy to address it in another post. Several people have asked me to write a post on moving internationally. Now that things are starting to calm down after my move from Indonesia to Scotland just a week and a half ago, I have some time to write some advice for anyone who is preparing for an international move. I have moved overseas under a variety of circumstances and with varying levels of support and choice. My first international move was from the US to Nepal as a Peace Corps volunteer, where there was loads of support but little choice in where I lived, and the living conditions were primitive (which you expect as a Peace Corps volunteer, of course, because that's the point). Later, my family and I moved internationally a couple of times when my husband was affiliated with the US embassy, so we lived on American compounds. Again there was loads of support, but absolutely no choice in where we lived as we were in the embassy housing pool and were placed in what was available and appropriate for our family size. I found the housing to be excellent and comfortable, but many people (especially trailing spouses) were frustrated by having absolutely no choice in where to live, or even the lack of choice of furniture (which was provided). We moved to Scotland previously so my husband could do a graduate course, and that time we had no support at all but all the choice in the world. We chose our own house, car, car insurance, school, etc. Despite sharing a common language, it was difficult to figure out how things work in a foreign country and my learning curve was steep. We moved to Indonesia where my husband worked for a company whose home office is in the US, with local project offices. We had lots of help from the local staff, which was hugely helpful since we speak no Indonesian at all. We had to rent our own house, get a car and choose a school for our kids, which we would not have been able to accomplish without translation assistance. Now we are back in Scotland, again with no assistance but loads of choice. This time things are easier since I did most of the figuring-out last time. Things are more complicated though as we are trying to buy a house instead of rent like we've done previously. But because we are in the place we love, and chose to come to, our happiness level is much higher than it has been in other circumstances! Under all of these different situations, I've discovered that the most important tip for personal satisfaction and a level of sanity is to feel like you have some control over your circumstances. This is especially true for trailing spouses (what they call the spouse of the main employee). You are in a foreign country because of your spouse's job, and you might not have much control over where you live (whether that means which country, which city, which area or even which house). Feeling like you have no control over your life leads to a deep level of frustration and discontent. I've experienced it, and I've seen lots of people experience it too. Another tip, which is the flip side of the lack of choice coin, is to be flexible. If you don't mind what color your curtains or couch are, or aren't frustrated by the lack of American food and products, you'll be much happier than if you have to have things your way. The happiest expats I knew were the ones who were just happy to be overseas, interested in the country they're in, and up for anything. They kept the big picture in mind and counted everything as a life experience. I always admired these people but, especially after many years overseas with no choices, I wasn't able to reach that level of contentment (until now!). It helps enormously to learn the local language, and if the alphabet is different learn to read it. If you don't speak the language, you will feel cut off from the country you live in. Also, if you aren't working, get as involved as you can stand to be. Having someplace to go and people to talk to on a regular basis will make a huge improvement in how you feel. I know you were expecting some actual tips, like how to research the country you'll be moving to and things like that. To be honest, when you're moving overseas you often don't have much choice in where you are moving so country research is not all that crucial except for you to know what to expect when you get there. But, in my next post I will give you some tips on researching countries and cities, moving advice and other logistics. Obviously I could write an entire book on this topic! Is there anything specific you'd like me to cover in my next post? Many thanks to Paulien (writer of the Girl In Maths blog) for this excellent review of the Quo Vadis Space 24 weekly planner! I've been considering this planner for a couple of years, but I don't care for the green-tinted paper (same as in the Journal 21). But it looks so nice, I may have to reconsider! After a conversation on twitter with Laurie in which I expressed my love of the quo vadis space 24, and she mentioned her doubts about the greenish tint of the paper, I proposed to write a review of the planner and show how I use it. So, here it goes. Don’t you think it is a pretty colour? I think they could be useful to write longer-term deadlines and travel in it. I had never used them until about a week ago, when I started the 30 day shred exercise dvd program. I now note which exercises I did. Any other ideas for using them are more than welcome of course. As you can see, the weekdays are on the left page, with time slots from 8:00 to 21:00. I had to get used to the notation of the times, but to the Americans among you they may be more familiar. The weekend days are on the bottom of the right page, with less space and no time slots. I know some people are equally busy on weekdays, but this is perfect for me as I don’t need to write a lot on Saturday and Sunday. And it nicely separates the week from the weekend. The largest part of the right page is left for notes, which I love. The paper is cream, with maybe the slightest hint of green if you look very closely. But if you don’t know it’s there, you might not even see it. It goes well with the blue printing, and with the blue ink of my pilot pens. You see my weeks are more filled with tasks, with very few appointments. I use the weekly part with slots to write in those few appointments, and to block out time for larger todos. At the top of the daily space I note any important information for that day, like a birthday or unusual work hours of my husband. Then on the right you see the tasks I have to do for that week. Having them there keeps them visible, and I get a complete overview of the week and what I still have left to do. The times printed on the page give me the opportunity to block out larger amounts of time, and to see how much time is left open in the week. 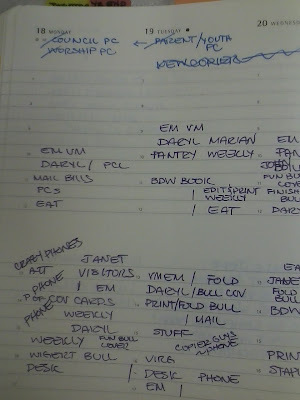 I couldn’t do this with a week+notes version without times, such as the moleskine one, and so they never worked for me. The other features of this planner are familiar to anyone who has seen a quo vadis minister. There are maps, payments pages and an address book that I don’t use. I may replace this with a notes insert, as I think this is the only thing missing in this planner. I hope you have enjoyed the look into my space 24 planner, and most of all, I hope I have convinced Laurie to give it a try. Thank you for reading. You might remember Mstraat's excellent guest post reviewing her Moleskine Taskmaster weekly planner. Due to popular demand, she has graciously agreed to a follow-up post detailing how she uses her Taskmaster! Thank you Mstraat!! 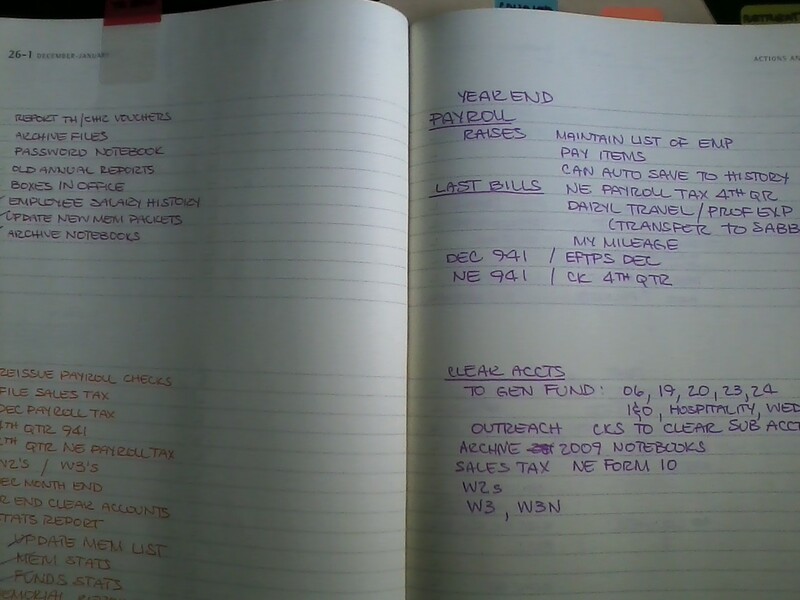 As promised, here is a peek at how I have been using the Moleskine XL Taskmaster this year. For the first time I have separated my work and personal planning, as Laurie advises here and I am very much appreciating her advice. Other than a couple of phone numbers or emails, I don’t need work info at home because if something untoward happens I’ll have to drive in to work anyway. As long as I know I have it all written down in the Taskmaster, I have been much more able to leave work at work this year. This book lives on my desk, in front of my computer monitor. I don’t use the month grids, which I thought were necessary. But I have a pre-printed month on two pages calendar that has all the national and regional dates and other info needed for office planning that is used for room scheduling, and I found it a waste of time to write this in two spots. Likewise, the information pages for international holidays and so on are unused. The bulk of the Taskmaster consists of alternating pages of weekly vertical, timed pages and lined pages with tick boxes for that week’s lists. I am using the weekly pages to log what I have done each day on the timed lines. I work in a one-person office and make a time log every couple of years just to keep an eye on myself and the work flow. Blank spots mean I was still doing whatever was last listed. I use the space at the top of the page for day-specific items, as I have very few of these. 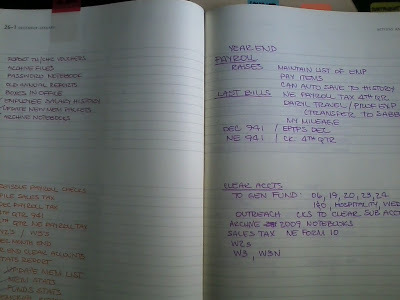 I use a different color ink than in the log to mark these to dos or appointments so I am less likely to overlook them. A slash mark on the left means a completed task and a wiggly line through an item means it didn’t happen. The only synching (is this a word?) I have to do with my personal planner is a very occasional note to open the building outside my regular hours. For me the most useful part of the Taskmaster are the two pages for lists following each week. 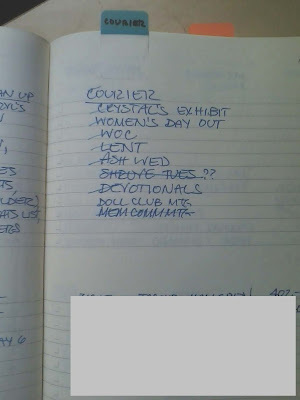 To dos for an upcoming week that are not day-specific are written into the top left page as they come up. Most of my to do list lands here as my job requires me to remain completely flexible and I can’t schedule tasks at a certain time. It’s not hard to scan the weekly list and do the next task as I get time. (See below for how I handle non-deadline to dos/goals.) I use the same blue ink as the top page notes so I can quickly tell if I’m in the week or on the page behind it as I flip pages. 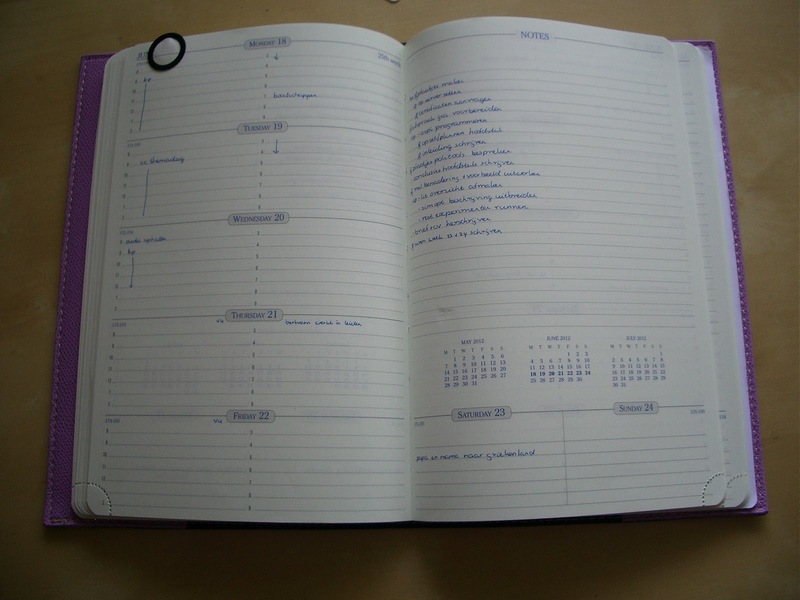 A system for recording other sorts of information has evolved: information on orders for supplies, books, etc., is recorded on the bottom left page and phone calls are recorded on the bottom right page. To do lists that rotate by week of the month are on the upper right. First week is month end bookkeeping, second is board meeting agenda, third is monthly newsletter (“Courier” in the photo) and fourth is non-deadline to dos (Still below). I use four removable tabs to mark these lists. Just for the record, the Post It brand stick better than Avery tabs for me. Finally, the fourth-week list gives me a place for annual to do lists, one-time projects, or ongoing to dos that need to happen sometime. 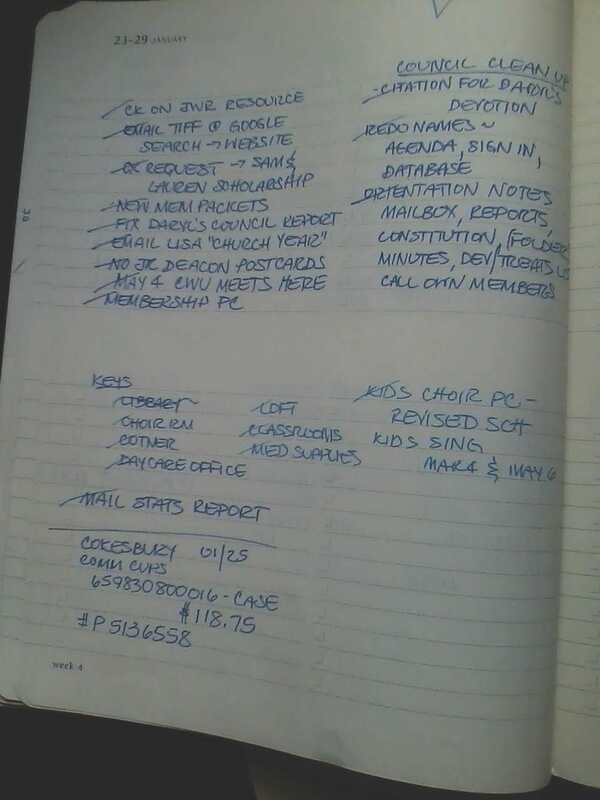 For example, in the picture you’ll see my 2011 year end to do list, which won’t be exactly the same next year but will give me a list to reference. One time projects would be, for example, publicity for a capital campaign, and the ongoing, non-date specific list includes things like archiving annual files. Annual and one-time lists are easy to find by date; the ongoing list has a tab and when most of the items are marked off I transfer what’s left and start a new list on the current fourth week. At the end of the Taskmaster there are a few blank note pages which seem useful but I haven’t used them, and the address booklet and back pocket are unused as well. Addresses are in the computer (with multiple on- as well as offsite backups, should you be worried about this). My conclusions about the Taskmaster? It is working well for this year, though I am not using a lot of its features. Next year I don’t plan to track my time, so that leaves only the spaces at the top of those pages and the list pages for me to use. I will find another planner for next year—but if you need to keep track of both time and tasks, the Taskmaster might work for you. Poll Result: Would You Buy Plannerisms Planners? Many thanks for the show of support from the vast majority of people who would be interested in buying Plannerisms Planners! No thanks, I'll stick with other brands. Many thanks to everyone who participated in this poll. I hope the Plannerisms planners will be available for you all soon! The 2013 range of diaries are now available on QuoVadis-diaries.co.uk and Organised-Mum.co.uk! Quo Vadis diaries are known for their spectacularly smooth paper and structured formats. I've reviewed many Quo Vadis diaries and planners over the years, click here to see my reviews of Quo Vadis diaries. Organised Mum diaries are well-known for their helpful features such as meal planning and shopping lists, budgeting and expenditures pages, holiday planning and more. 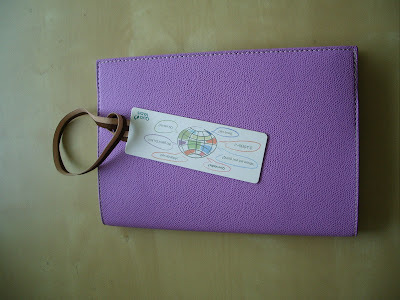 I have reviewed the 2011 Organised Mum diary, and the 2012 Organised Mum diary (with improved paper) along with the purple faux leather zipped cover. If you have any questions about Quo Vadis Or Organised Mum products that I've reviewed, I'd be happy to answer or describe more fully anything you're interested in. Both of these companies make excellent products, and they both do a wonderful job of listening to their customers and creating products to fulfill their needs. Many thanks to everyone for your kind words of support during my move! I'm VERY happy to be in Scotland! We're in a self-catering holiday cottage while we search for a house. This week is busy with house-hunting, car-buying and other details of setting up our life here. I'll be back with more posts soon! Today my family and I are moving to Scotland! Again! These last few weeks in Indonesia have made me realize that, under different circumstances, I would have found more things to enjoy here. But, my heart's in the Highlands so I'm saying farewell to Jakarta and am moving back to my favorite place, Scotland! I'll be offline for a few days while I'm in transit. I've been promised that we'll have internet in our cottage where we'll be staying for the first month, so I should be back online again soon! Would you buy Plannerisms Planners? I've had several people over the years ask me to design and publish my own Plannerisms planners, based on my experience using and reviewing so many different planners. Well I'm happy to report that plans are in the works to make this happen! I have designed Plannerisms weekly planners with features like goal setting and recording pages, space each week to log daily goals, weekly space for lists and notes, monthly calendars, and more. I've also designed daily planners with similar features. I'm trying to gauge interest in these planners. Would you be interested in buying planners engineered by me, with all my favorite planner features? Please vote in the poll in the sidebar! Today is my last packing day before the movers come tomorrow to take it all away! We have to pack our luggage today too, even though we're not leaving for a few days yet, to make sure everything will fit in our luggage. One time when we moved, we vastly overestimated how much would fit in our bags, and after the movers left we had to mail several boxes to ourselves! Not an option from here, so we have to be careful with how much we pack. 1) Most important and/ or irreplaceable items go in our carryons. 2) Things we'll need immediately go in our luggage. 3) Air shipment (to arrive in about a month): Things we'll need within the first month (like bedding and non-breakable kitchen stuff) goes in our air shipment. We get 700 pounds for this, which fills up quicker than you'd think. 4) The rest of everything goes on a ship which takes 3-4 months to arrive. So, I have to decide what I can live without for a quarter of the year, what I need sooner, and what I can't part with at all. My Ivory Deco and Holborn Zip Filofaxes are going in my carry-on bag. So are my self-drawn weekly planner and my pocket daily Moleskine. In my luggage are my Aston Filofax, my Moleskine monthly notebooks for this year and next year, my Quo Vadis Notor, and a blank Uncalendar Monthly planner (which I plan to use to record how many books my kids read over the summer). I've also packed two Alwych notebooks (one Large one Pocket) and my Scotland reference Filofax. And, I'm bringing my Woman's Success Choice Address Book in my luggage as a possible info, reference and address book because it is very slim and light in my bag. 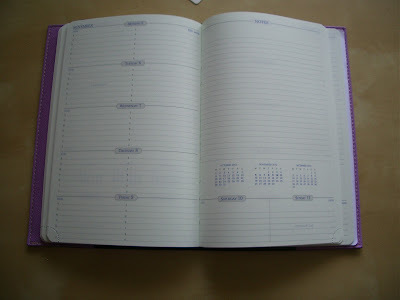 Filofax: my A5 and personal size purple Finsbury binders and my personal Buckingham. Moleskine: the Star Wars planners and large daily Magenta. 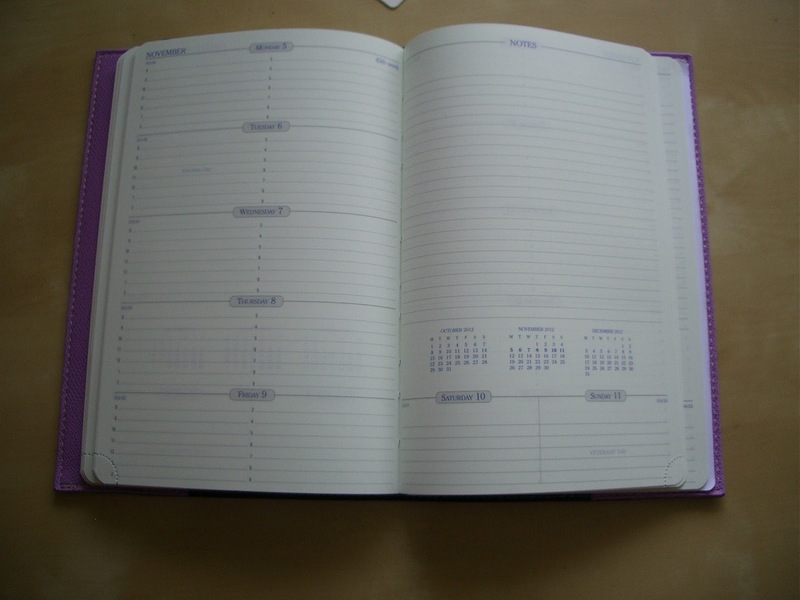 Woman's Success Planner: Quarters 3 and 4 2012 and Quarter 1 2013, plus the soft leather cover. Several Clairefontaine notebooks just in case. The rest, unfortunately, has to go in the sea shipment. I'll be offline for a couple of days while the movers are here packing up everything and loading the truck. I hate being without my stuff so packout is always a bit traumatic! Wish me luck! Why do we keep buying Moleskines? 1. You know what you're going to get. This is the same reason why my husband's grandparents eat at McDonald's when they are traveling in foreign countries. They know what to expect, and they know they're going to like it. When you buy a Moleskine, you know it's going to be well made, good quality, and generally pleasant to use. 2. You can get them everywhere. At the airport, online, at Target, in other countries. No matter where you are, you know you can get your hands on a Moleskine. It reduces the intimidation of writing in one when it's not so rare you'll never find another one. 3. It's appropriate in any situation. You don't have to worry about busting out your screaming pink Hello Kitty planner in a board meeting. The black cover might be boring, but it can go from a meeting with the CEO to getting spit up on at playgroup. The solid construction looks like quality, and I have to admit it's just a classy-looking book. 4. They keep coming out with exciting new stuff. This is what has me gagging for more Moleskines. I mean, how can I pass up Star Wars planners? Colored covers? New formats? Endless sizes from teeny to huge? I'm always chomping at the bit to see what they'll come out with next. Those of you who buy Moleskine planners and/ or notebooks, why do you keep returning to the brand? All Daycraft products available with free worldwide shipping! Many of you who have read my reviews of Daycraft notebooks and planners have been frustrated when you couldn't find the products you want in a store near you, or that overseas shipping was too costly. Great news! Now you can order directly from Daycraft with free worldwide shipping. Don't freak out when you see the prices in Hong Kong dollars, just use a converter and you'll see they are actually normal prices. PS I recently got an email from Daycraft letting me know they are running a Father's Day special: When you buy The Moneywrap online before 18 June you'll receive 20% off your next Daycraft purchase. For the backstory, along with descriptions of why I've used (and stopped using) various day per page planners, and even speculation on what DPP I might use next year, see my video Daily Diary Litany here. 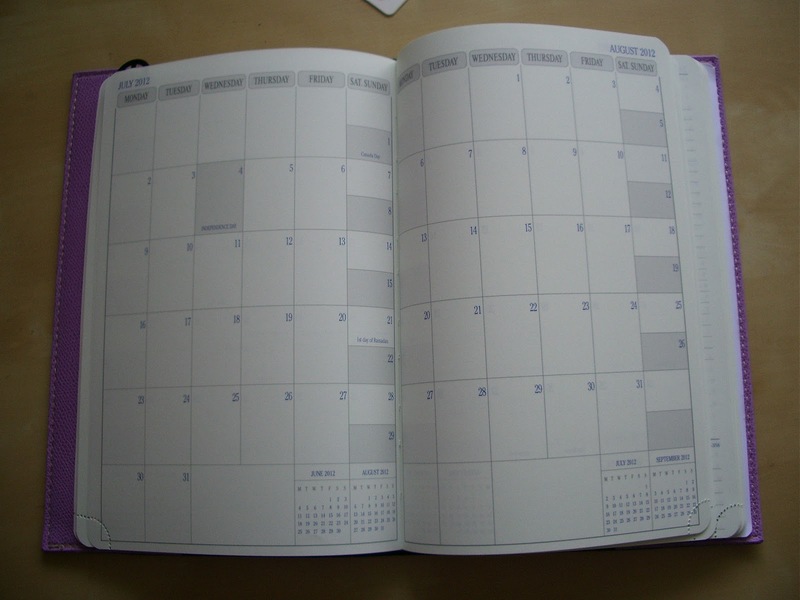 Helen's amazing Moleskine blog planner! Helen at Fennell Books recently contacted me to show me how she converted her Moleskine weekly planner into a supercool blog planner with cut-out photos. I asked her if she would be interested in doing a guest post here on Plannerisms about it and she graciously agreed. But unfortunately I had technical difficulties while loading her images, and my pre-move frazzled brain just couldn't sort it out. So I apologized and asked if she would please post it on her own (excellent) blog. After all that, here is her wonderful post with lots of photos of her creative and beautiful Moleskine blog planner! Thank you Helen for sharing this with all of us! It's very inspiring! For most of the past 8 years I've bought all my planners online, because I've been living in places where I can't buy planners locally (except for when I briefly lived in Scotland). So, I have a lot of experience with planner websites, and I have certain expectations of what my online shopping experience should be. I've purchased from many different websites over the years. Just some that come to mind are Amazon.com and Amazon.co.uk, Dodopad.com, Moleskineus.com, Letts.co.uk, Filofax.co.uk and Filofaxusa.com, CollinsDebden.co.uk, TheSuccessChoice.com, Uncalendar.com, Quovadis-diaries.co.uk, Organised-mum.co.uk, WeekDate.com, PlannerPads.com, UndercoverUK.com, TheDailyPlanner.com, LoveNotebooks.com and Alkos.com, just to name a few. I've also shopped via brand websites that don't sell directly themselves but direct you to retail sites, such as QuoVadisPlanners.com and Paperblanks.com. It's been interesting to see how these websites have changed and evolved over the years. Designs change, features change, and some things come and go. For example, it seems like most planner websites have planner ratings or reviews at some point, then most eventually get rid of them because they become a confusing jumble of positive and negative reviews. I've noticed most often the negative reviews have nothing to do with the planner itself and are usually about a delivery problem. I prefer customer testimonials (such as here on Uncalendar), I find those much more useful because they give me ideas on how to use the planner. 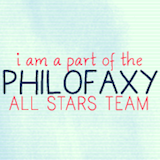 Another thing I like in a planner website is an associated blog. I've been reading the Quo Vadis blog for many years, and I love the mix of posts about the products as well as topics of general interest to planner users. The Quo Vadis blog creates a dialogue directly with customers, asks for feedback, and announces product launches and changes. It is my gold standard for what a planner brand's blog should be. The number one feature a planner retail site must have is an effective search engine. Like I said above, I give it about 20 seconds and if I haven't found what I'm looking for I move on. When I visit a site, I usually have a good idea of what I'm looking for (a day per page planner, for example, or a weekly desk planner). Letts UK's diary page has an excellent Search feature that allows you to narrow down your search by format, size, price and even color so you can easily find what you are looking for. In addition to a search feature, I want to know as much about the inside of the planner as possible. Ironically, I want to find the format and style I'm looking for quickly, but once I find what I'm looking for I'll spend hours comparing features before deciding on which planner I'll buy. I want close-up photos of the daily or weekly layout. I want to know if holidays are printed on the days. Are there also month calendars, and if so what is the format? I want to know if the paper is white or cream, and the weight (gsm). Are there any international information pages? Sunrise and sunset times? Maps? Notes pages? It's all important. Usually I'm comparing one planner to another of a different brand, and I almost always go with the one that has more features. Again, Letts UK's website is excellent because it lists all the interior features of the diaires and shows photos of the layout (here is an example (when you choose a color it shows you the interior layout)). Another excellent example is Organised Mum, with lots of photos of the interior features. I pore over photos like this when deciding whether to purchase a planner. The more photos and more information, the better. There are some planner website features that are nice, but aren't as important to me. Many sites hold your information so later you can reorder with just one click. Because I move so frequently, I have to enter my new address anyway so one-click ordering doesn't make any difference to me, but many people find it very convenient. Also I've noticed a trend lately that some sites have too much going on in the home page. Moving images and cluttery layouts just make it harder for me to find what I'm looking for. And, more and more planner brands are on social media with Twitter and Facebook where they can communicate directly with customers and even run contests. What do you like in a planner website? What features make you come back again to the same website? And, what features turn you off and make you move on to a different website?